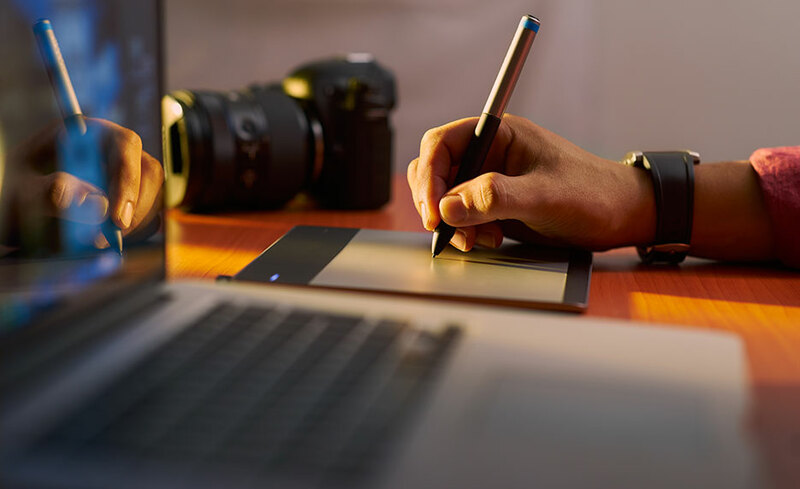 The Digital Arts Online Training Program will help you develop technical skills and creative artistry in digital imaging, traditional drawing, and digital illustration. You’ll learn professional applications for Adobe Photoshop and Illustrator alongside traditional materials like pencil and charcoal. Course projects include retouching, compositing, digital illustration, and still life drawing. You will be able to create basic line drawings using pencil and paper following the principles of perspective and proportion. You will be able to identify and draw positive and negative space in a drawing subject. You will develop an expanded range of skills in Illustrator for creating photo-realistic illustrations, complex patterns, and richly illustrated designs. You will be able to use color sampling, meshes, blends, masks, 3D tools, and tiles to create both realistic and stylized artwork. You will develop drawing skills that show the ability to analyze a subject, represent realistic form and perspective, manipulate value and color, and reflect contemporary stylistic approaches. Your work will be informed by subject, lighting, color, and media choices. You will be able to create straightforward, clear, balanced, and stylized icons, sequential illustrations, logos, and editorial illustrations using Illustrator's shape tools, freehand drawing tools, and classic illustration techniques. Your work will show an ability to communicate complex graphic and editorial concepts in digital form. Looking to make your mark in the digital arts? The Digital Arts Online Training Program will give you the education you need. You'll gain hands-on experience in fundamental technical and creative skills in digital imaging, traditional drawing, and digital illustration. You will master the intricacies of Adobe Photoshop and Illustrator, build your understanding of color, and explore the representation of form through vector illustration and drawing. Hands-on projects focus on core skills and provide you with experience in traditional and digital media. Class assignments include digital imaging, vector drawing, traditional drawing, color and composition, and editorial illustration. When you register, you receive twelve (12) months to complete this program. Learn basic drawing techniques and how to see and think about form and space. You'll get a better understanding of visual forms and representing those forms on paper. Class projects involve sketches of contours, negative space, and simple and complex forms. Gain a working knowledge of Illustrator's advanced features, from tough Pen tool challenges to gradient meshes, symbols, and effects. Students learn how to create photo-realistic illustrations, complex patterns, and rich designs, speeding their efforts with workflow features. The course builds on basic Illustrator skills to tackle high-end projects with depth, dimension, and wow-power. Learn how to analyze what you see in the world around you and communicate it on paper. Through hands-on projects, and guided by a professional artist, you will explore the critical concepts of line, mass, form, perspective, value, and composition, building a solid foundation for all your art and design work. And most importantly, you'll also discover that drawing can be fun. Did you know that spheres have inner edges? Or why artists measure with their thumbs? Grab your charcoal and chalk pastels... this course is your first step to developing your craft as an artist. * A digital camera for photographing drawing work. * Basic drawing supplies including pencils and sketch paper. The certificate program is designed for adult learners interested in building skills and portfolio for a design career. Students can enroll at any time, with monthly class starts. Jordon Schranz is a New York/New Mexico-based visual artist, musician, curator, and educator whose work focuses on the idea of social and political interaction and their underlying cultural structures. Jordon earned his BFA in Painting from the Maryland Institute College of Art. Currently he is working in Las Cruces, New Mexico on an extensive project based on security camera footage and themed around issues of privacy and surveillance. In addition, Jordon is an active member of the New York experimental music scene, regularly curating, performing, recording, and promoting avant-rock, free jazz, noise, and experimental music performances in addition to running Tigerasylum. Jordon is the Director of Fine Arts for the Sessions Online School of Fine Arts and an instructor at the Las Cruces Museum of Art and the Preston Contemporary Art Center.